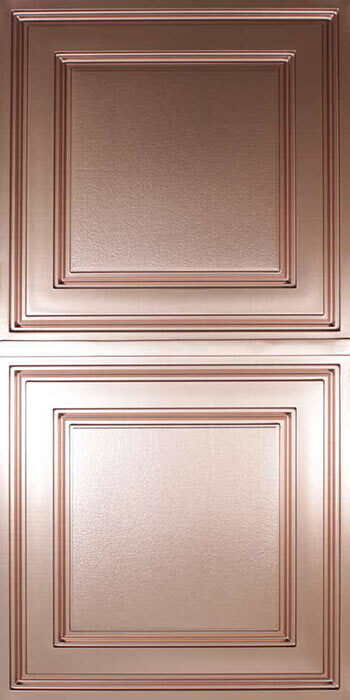 The Stratford Vinyl Ceiling Tile - Faux Bronze (2x4) is made from a UV Stabilized .013" thick vinyl plastic. It is designed to provide all the functionality of conventional drop ceiling tiles at a fraction of the weight. The feather-light construction makes it easy to install, easy to clean, stain resistant, water resistant, dust free, and resource friendly! Installation is fast and couldn't be any easier. 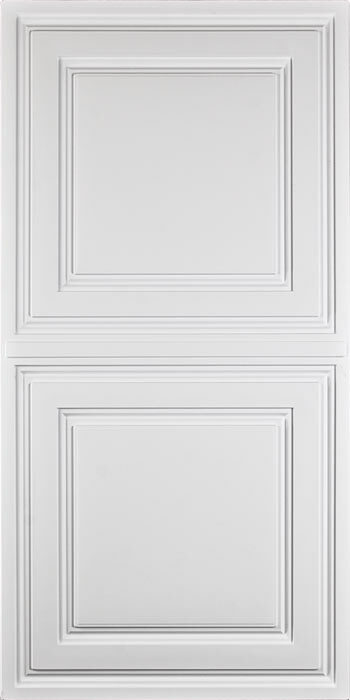 The Stratford grid tile is our most popular selling drop ceiling tile. Our customers are continually amazed at it's ability to transform the look of their room. It's classic simplicity makes it a great option for any type of space. The repeating design of this 2x4 tile gives it the unique ability to create the look of a 2x2 tile, which can be nice in smaller spaces. You will find that it is a great time saver since it will help you cover twice the space in half the time. Being that it is Class A Fire rated, it is an excellent choice for most businesses and homes. We are also proud to say that it is made in the USA. Since the Stratford tile is not flat on the back, it is not suitable for use as a direct mount tile. While it is only .013" thick, the embossed design gives it the rigidity and structure needed to support itself in the grid without sagging. To avoid the risk of sagging, we discourage placing any weight directly on the tile. If you would like to keep your existing acoustical tile in the grid for insulation or sound barrier purposes, we recommend that you place it above the framework so that it is not putting any weight on the Stratford. It is more than likely that your room has partial tiles around the perimeter. Not to worry- The Stratford tile lays nice and flat in the grid when cut to any size. Since the recession of the design is only .5", the gap is unnoticeable for most applications. View product images and customer installation photos for examples. If your grid is already white and in good condition, it should match the white Stratford tile very well. If you are going with a colored option, we highly recommend that you consider the Grid Tape or Grid Strips since they are color coordinated with the ProLite collection. If you would prefer to avoid the extra expense, you can of course paint your grid as well. The ceiling tile manufacturer guarantees that your tiles will be free from manufacturing defects for a period of five years from the date of purchase. We are unable to replace items that have been modified or installed, so please review all the contents of your shipment for damage and to verify that the items received are correct. Damaged items, or items shipped in error, that are not modified will be replaced promptly. Custom products do not qualify for a refund if returned. 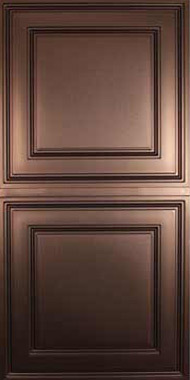 Custom products include, but are not limited to, the Imagination Series, Leather & Wood Tiles, and Custom Tile categories. Amazing quality and exactly what we needed! Product was easy to install. It looks great. Price is outstanding. These tiles really brightened up the basement. So easy to install. Very flexible and easy to cut to fit in any location. Would recommend highly. I have gotten a lot of compliments on them. I replaced the old ceiling tiles in my kitchen with the Stratford tiles and they look amazing. Really gives my kitchen an updated look. Very install to install and everyone loves it. Thank you for your feedback, Charles! We’re happy to hear that you’re loving the look of the Stratford tiles in your ceiling! We also appreciate the installation advice; however, due to the thinness and design of the Stratford tiles, we do not recommend that the existing/old ceiling tiles or insulation (other than our Soniguard tiles) be placed on top of them, because this can cause the Stratfords to be crushed or to begin sagging under the weight. Instead, we recommend using our Uplift Prevention Clips along the top of the grid system every couple of feet to prevent the ceiling tiles from lifting out of the grid system due to air pressure changes. If keeping the old tiles and insulation is preferred, it’s best for these items to be placed above the gridwork so that they are not adding any weight to the Stratford tile. 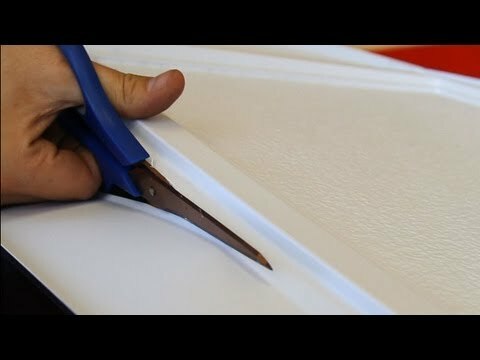 You can view our video “Your Old Ceiling Tiles” (https://youtu.be/sD-g8PhOWjE, or on any Stratford product page) to learn more about how to place the existing tiles above the grid system in order to make room for any of our Featherlight Series (.013”) ceiling tiles. Hopefully this helps answer your questions as to why we do not recommend installing any items directly on top of the tiles. We thank you for using our Stratford vinyl ceiling tiles for your ceiling project and hope you enjoy them for years to come! These ceiling tiles provide a new look and polished finish to my basement. Easy to install and very easy to cut and shape. Would strongly suggest, very easy to install and looks great. We ordered these for our office space that had a very outdated ceiling. Relatively easy to install. The only reason I gave it 4 stars instead of 5 is because they are pretty costly. We love the way they look in our office and how they changed the space. Wanted a 2x4ft ceiling tile that was lightweight and would not trap dust. Easy to install. The fact that the tiles are easily cut with a scissor is a selling feature. The tiles are easy to cut and install. I was able to replace the entire ceiling very quickly. The room looks much brighter. The panels really lightened up the small bathroom. Pewter is light metal looking. Were easy to work with and cut to fit old grid work. Love the look and punctual delivery . 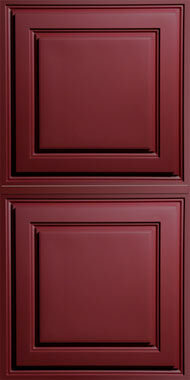 Stratford ceiling tiles make an unbelievable difference in the appearance of a room. We installed these ceiling tiles in our basement family room, replacing old, ugly acoustic tiles in a grid system. Not only does the ceiling look so much better, it feels lighter and more airy. We had installed the old acoustic tiles as well, and these vinyl tiles were much easier to install due to their flexibility. The only downside is that now, with our new beautiful ceiling, the rest of the decor looks a little shabby by comparison. Guess I'll have to work on that now. Easy to install! Looks great! Product arrived quickly fair price ! My contractor is going to recommend these to his customers. Their flexibility makes the install so quick and easy. This is a top rate company. I received this product in 2 days and it was free shipping! You can’t ask for any better than that. BEAUTIFUL. LOOK RICH LIKE WOOD. VERY FLIMSY. TOO THIN FOR BEING 2 BY 4. THEY KEEP FALING DOWN. THEY CRACK EASILY AND ARE DELICATE TO WORK WITH. The tiles helps showcase the beauty of our Venue. It brightens up our space. Very easy to work with and really does give it a great look. I lifted the old tiles up a little bit and pushed the new flexible tile in and done. My wife and I both love the look of our new ceiling. Very classy looking product and very easy to put in. The ceiling has so much more definition and style. Came the day after I ordered. Easy to work with and much better looking than the builders grade tiles I had. If you have a drop ceiling I would recommend this product. Looks great and it was easy to use and easy to get. these panels look good but they are very thin and flimsy for the price. I put them up and they do look good. Of all the things we did in our remodel, the ceiling made the biggest difference and is what we receive the most complements on. Great product, great company, super fast shipping! Looks really nice in the ceiling, it gives an exquisite look to our office. However uplift is pronounced when office door opens. The tiles really look great and as a DIY project were very easy to cut to size (just using scissors) and to install, especially for irregular tile shapes and angles around a corner fireplace and inside corners. They should also be very easy to keep clean and bright. The tiles went up very quickly and easily. Greatly changed the look of my basement. Stunning, they were easy to put up. Room looks larger and our guess loved the look. Plus, Arrived on time very quickly. They are really thin - that’s good and bad news. It makes it very easy to cut them to size, but any mistake will leave them sagging or buckling because there is no stability. But the room looks so much better! Made my dining room area in my cafe classy! Great looking product for an excellent price!! So far so good after a month- looks great, easy to cut if need be, easy to install- would order again. I'm curious to see how much they sag after a year, if at all- but then I can always order the mid cross bars to help support them in the middle so I'm not anticipating an issue. Very easy to put up on existing rails. Looks so much better than it did. Really spruced up our kitchen. This tile jumped out at me and the pricing was right on point. So EASY to install and looks fantastic in my parents beach house.... I will be ordering more for the bathroom soon - love this product!!! Everyone has remarked on the transformation from these tiles. I installed them under the old tiles so I still have a sound barrier AND a great looking ceiling. Transformed the look or our lower lever lounge! Took an old tired ceiling and turned it into a luxury look. Friends are amazed at the change. The tiles upgraded our lounge and wine cellar at a reasonable cost. Installation was easy with the lightweight tiles. The tiles were easy to cut to size.. Very lightweight. We have installed both the black ceiling tiles in one room and the same tiles in white in the other rooms. They look gorgeous once installed. I recommend getting the same color grid tape or same brand of grid because we used Armstrong grid and the colors are off slightly when using white ceiling tiles. For the black ceiling, we spray painted the ceiling grid black and it looked fantastic! The only complication we experienced was keeping the tiles in place as we filled in the grid. They are so lightweight that they don't weight down the grid and as soon as one shifts, they can fall out of place. It was definitely a two person job. They attract dust and dirt so make sure your hands are clean as you install. We were doing a basement finishing project and our hands would get dirty as we worked so we had to remove the tiles to wipe clean and replace which was a bit time consuming because they kept falling out of place. The final look is definitely worth the time and effort using these tiles. Product is amazing! Very lightweight and easy to trim. We installed under the insulated tiles that were previously up. No problems with that whatsoever. Transforms the room -- I just love it! Had current drop ceiling replaced with these and I absolutely love ! We love it! It completely transformed the look of our Theater room. it's so fast and easy to do anyone can put a new ceiling in in a day... We will be the other rooms in our basement soon. We used these in our bar of our restaurant. The customer s are so impressed. They love the color and couldn’t believe we in stalled the i tire ceilings in 1 night. Very easy to do! We have these in 2 of our businesses and they really change the aesthetic of the space. These were easy to install, and look so much nicer than my old style and stained ceiling tiles. I am very happy with this purchase! The appearance is greatly improved and we are more than satisfied. We hired a local firm to install on our original grid and they were extremely complimentary about the ease of installation even with the grids original layout which necessitated many more cuts than normal. We had white 2x4 acoustic tiles that were sagging. Replacing with these wasn't cheap, but you get what you pay for. These look fantastic and have truly given the room a theater-like feel. 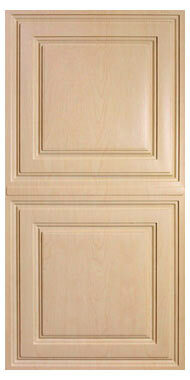 Very easy to install, and the decorative strips are the (don't skimp---get them) finishing touch. I had to take my time , and follow the instructions, but it looks fantastic! The vinyl tape really cleaned the look up. This is a great product. Initially had concerns for the thinness of the tile. However, after ordering a sample tile found no worry for concern. Went up with relative ease, just took my time and was relatively careful putting them in place. Had no tears like I read on some other comments. Have had no problem with them lifting or rattling due to lightness either. As a matter of fact due to their thinness, cutting the perimeter pieces with a good pair of shears/scissors was very beneficial. The finished ceiling looks fantastic! At about twice the price of mineral fiber tiles, they are well worth the investment. They look better, are more functional, and cut and install easier that traditional tiles. We have gotten lots of compliments on our new ceiling. Idefinitely would buy these again! The tiles and the LED lights have transformed a drab 70's basement into a place people want to hang out. What a great product. Clean neat simple to trim and the end result is perfection. The cardboard type should be outlawed. Love the look of these ceiling tiles. With the help of my handyman, I put in 800 square feet of it upstairs, and now I'm saving up to do the entire downstairs, which is a little larger. I have some pictures but don't know how to post them. The first thing people say when they walk into my basement is....that ceiling is incredible! Thanks for providing an amazing product that is made in the USA! but these tiles are thin and I don't think meant to be installed alone. They just slid into the grid under the original ugly tiles...easy to do. The install was easy. cutting the tiles was a breeze. It would be nice if the tiles were just a bit thicker to add some more support but once in they are fine. If you plan on adding ceiling lighting you need to add reinforcements to hold the lighting attached to the ceiling as the tiles cannot support any weight. Awesomely beautiful look for so little work and very little cost. Very pleased! Makes a drop ceiling look better! We used this with an existing grid to update the look of a small addition. Shipped quickly and was easy to install. Like other reviews I have read the tiles are definitely thin so we left the old tiles in place and installed the new ones over them to help with sound and stability! Overall I am happy with how it turned out. great product - easy to work with as can cut with scissors - light weight so easy to place in grid - does not cause grid to sag - everyone that comes into view my basement whether it be county building inspector, electrician, plumber, or friends state how nice the ceiling looks. By way, company is great also - had questions so contacted them and got quick answers - great customer service! We are extremely pleased - very easy to install and makes our basement look so much nicer than a typical drop ceiling. It was very easy to cut holes for the lighting. Also, they arrived very quickly and were all perfect. 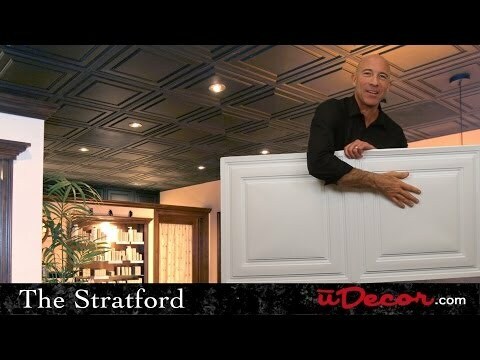 The Stratford Vinyl Ceiling Tiles are the simplest and easiest way to replace on dungy 2x4' drop ceiling tiles. Makes a room look modern instead like an office or school building. Only complaint, a little on the flimsy side. We're very sorry to hear about the issue you're having keeping the tiles in the grid properly. We have a few options that we think can help, and will be in contact with you shortly to discuss them. Thank you for your feedback! We forward to speaking with you soon. House looks great,took an ugly drop ceiling to a whole new level! The Stratford Vinyl Ceiling tiles really upgraded the look I had with the previous ceiling tiles. Easy to put up, elegant look. Tiles look very good, are easy to install, and are reasonably priced. There were shipped and arrived in a few days. They add a better look than standard tiles. The are easy to wash. They are not susceptible to water, and they do not damage easily. The tiles are exactly what I wanted, they complete the look. They are also extremely easy to cut and install. Worth the purchase!! I love these tiles. Easy to install. Look great. Will order more soon. I have the classiest ceiling in the neighborhood thanks to these tiles. They look super chic. You have to be careful when you're putting them up that you have very clean hands, as they take on dirt easily in the installation process. I highly recommend buying the black tape that goes over the tracks. I wanted something nicer than the standard ceiling tiles, and these were great! A lot nicer, easy to work with and they cost just about as much as those ugly standard tiles. If you are looking to spruce up your ceiling these tiles are the way to go. Looks amazing and made the room brighter than former acoustic panels. The room looks like an HGTV makeover and everyone loves the modern look. A terrific product, easy to install and excellent product support and service from the company. This is not what you find at your local home improvement store. Easy to install, looks like you expected it to look. People notice it and ask you about it. We used in to refresh our reception area - a hit. Our home is older and a drop ceiling was installed in our living room before we bought it. The tiles were looking old and warped so I decided to give these tiles a try and I was not disappointed! They totally update the look of our home and were so easy to install! Great price too. Not even amazon could beat this price and free, fast shipping. Needed to keep costs down on a leased space. These tiles did the trick. They are thin, but our ceiling is high and they looked very finished and clean when installed. We had an existing dropped ceiling so the grids were already up but some had to be moved to match the new tiles - We saved the old tiles for insulation and noise reduction and put them on top of the new tiles. If you don't have any to save you will probably have to buy insulation, the new tiles are thin. We installed Juno 7 inch square, led flushmount lights in the middle of four of the tiles and they look like they were made for the tile - all in all it looks great, very satisfied. So happy with the results!!! I recently updated my basement by replacing the industrial style ceiling tiles with these awesome vinyl tile. My old tiles were discolored and water stained. It's amazing how these new tiles transformed my space. It definitely doesn't feel like a basement anymore. I have received so many positive comments on them. They are light weight and easy to work with. I would highly recommend these tiles! As others have already stated....when you first open the box the tiles seem flimsy but once installed they transformed our kitchen ceiling. We have received many compliments from friends and family. Tiles are easy to install and really sets off the room! Looks great and so easy to install! 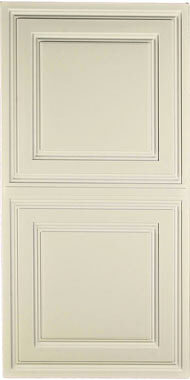 This is the second house we have purchased the Stratford vinyl ceiling tiles. The are easy to install and look fabulous. Love them and would highly recommend them. Product arrived very quickly and as ordered. I was a little disappointed as to how thin the tiles were which made them extremely delicate to handle. Other than that pleased with product and extremely fast service. Will order again. I used these to replace the 30 year old 'cardboard' tiles in my basement! They look awesome! Easy to install! I used the same grid system I had (which was black) and the contrast looks great. I replaced my yellowed crumbly traditional basement ceiling tiles and we're pleased with the results. The tiles go in fast and easily; you can't tell that they're made of thin plastic once installed. They won't break apart if I have to remove any to get to wiring, plumbing, etc. and think they'll last a long time. Look Incredible and Awesome Customer Service! I am remodeling an old commercial space in a historic area. l wanted something that would look nice and fit with the rest of the decor as well as something that didn't break the bank- these did both! When I called to see if they met fire code they were able to give me the right documentation and quickly help me out! The customer service was exceptional and I would use them again without a doubt! Super look at an affordable price!!! These tiles are super lightweight and easy to install. Easy to cut for that custom fit. Turns an average ceiling into one classy looking ceiling. A very inexpensive way to get an expensive look. Highly recommended. I absolutely love the way our new ceiling tiles transformed our salon! We love the Stratford tiles. They look clean, classy and were so easy to install. Love that they are easily cut to size with a scissors. We wanted an alternative to thr traditional fiber board. Very pleased. Put this ceiling tile in my basement to replace the old plain, this tile gives it a whole new look so happy with it. These look great and are easy to cut and install, but the price is completely out of this world. Customer has many future projects, but we will be dropping the sprinkler heads to the ceiling and using regular tiles. We replaced old ceiling tiles and added recessed lighting with the Stratford ceiling tiles and they are perfect. Delivery was a snap too!! My husband put up the ceiling panels in an existing drop ceiling. It looks WONDERFUL !!! I would definitely recommend these panels. I will warn that if you use them for the whole ceiling like we did it is quite bright.. We do love it anyway. The tile is great we love it BUT the decorative strips do not stay up. We are very disappointed with the quality. We're very sorry about your experience with the strips. One of our representatives will be in contact with you right away to resolve the issue. We appreciate the feedback, and look forward to helping you love your new ceiling! This product was a great value! I was afraid the 2 X 4 tiles would be flimsy. They are not! They are sturdy and lay flat in the grid. They are easy to install in the existing grid. My edges all had to be cut and are not full tiles and it still looks great! I am happy and would purchase these again! These tiles look great in our basement and we couldn’t be any happier. Shipping was fast and not a single tile showed signs of damage. I am a 67 year old woman. I have installed at least 80 of these in my basement (totally on my own). Just a pair of scissors and measuring tape and they look fantastic! I am so proud and happy. When the light is not on the translucent tile does not look nice. I understand why but still disappointed. Don't think I will use them. Ceiling looks much better than typical drop ceiling tile. Did not buy the tape for the rails but color matched the white to repaint. I did keep the old tiles up because the vinyl is thin and wanted more sound barrier. I would recommend. If I had the budget I would have bought the Cambridge. Easy to install and surprisingly durable. Definitely recommend. Brightened up a dim lobby! These ceiling tiles gave our office lobby a higher and brighter feel! They are easy to handle and install and are strong enough to hold smoke detectors and A/C ducts as well. Highly recommend! These Ceiling Title are the ultimate! The Stratford ceiling tile added just the flare needed in my downstairs bathroom and hallway. They were easy to cut to size and install. They are a bit light, but we haven't had any trouble with them. I would recommend them to anyone looking for a bit more style in their ceiling tile! Makes the room look totally different. I purchased 120 of these tiles to finish my basement with. I received them 3 days after ordering. They arrived in great condition. The packaging was done very well. They are easy to install and look tremendous. 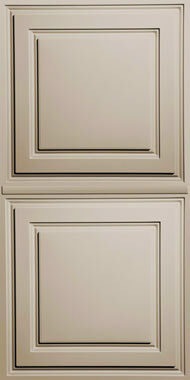 After I purchased these tiles, I saw the same tiles at a name hardware retailer for $240 more! You won't be unhappy by using this dealer. Once these are installed they look very elegant! Nice ceiling for the price. Very easy to cut. It is light in weight, thereby putting it ahead of competition! The look of the room is much improved, and also no worry anymore about water staining, as the tile would just dry, and be able to stay in use, rather than requiring replacement!! I was worried that these tiles would be too thin, but they are sturdy and look great! This is the second time I purchased these tiles. Once for my house then again in a different color for my business. Love the end result and super easy installation! I love the simple and elegant look of these tiles. It really dressed up the drop ceiling. The only thing I wish I knew before I purchased: you can't keep original acoustic tiles and insulation in ceiling grid, as the new tiles won't hold the weight. I am building out a cafe and the space had a dropped ceiling. Not wanting the large expense of drywalling the ceiling, but knowing that the dropped ceiling with standard tiles would NOT work in my design, I gave these tiles a try. They have made all the difference in the look of my space. I was able to fully install them myself, which saved a lot of my budget. The 4 stars and not 5 is simply because it might be morw accurate to call these tile "covers" because I really had to install them over the existing, far more substantial standard tiles. Had I simply installed these alone, my entire ceiling would have lifted and rattled every time a customer came in the door. Overall, I am happy with the treatment and have gotten compliments on the look as well. Takes the den to the 90's from the 70's . Would have given 5 stars if the tiles had been separated from the light cover tiles! Cannot easily tell them apart (contractor 101 for stupid workers) the light covers were sent along without separating them or tagging them as such. My paid contractor cut them up as regular tiles and I had to purchase new tiles and wait a week. So 4 stars could be 5 if UDecor had covered the issue by identifying the separate tiles!! We sincerely appreciate your feedback regarding separating tiles, and will be taking steps to prevent this issue on future orders. A representative will also contact you shortly to discuss the problem and assist with a resolution if possible. We’re happy to hear that you’re pleased with the look of the tiles in your den, and hope you enjoy them for decades to come! Good idea. Looks nice, but this company does not separate the tiles!! They look so similar a lot of trouble can be avoided at the supply end. My contractor cut them up as regular tiles, which cost me an extra 80 bucks plus a week of time. We sincerely appreciate your feedback regarding separating tiles, and will be taking steps to prevent this issue on future orders. A representative will also contact you shortly to discuss the problem and assist with a resolution if possible. We’re happy to hear that you’re pleased with the look of the tiles in your den, and hope you enjoy them for years to come! We kept the old tiles on top of the new vinyl for sound dampening. Matched the color at local paint store to paint the hangers given the size of the project, over 1,200 sf. Cost effective versus replacing with permanent/sheet-rock ceiling. Did it ourselves over a weekend. Really changed the appearance of the room and it looks great! I needed replacement panels to replace ones that were damage by a roof leak. The order was processed quickly and I received the panels shortly thereafter. The ceiling looks great once again!!!! Gave my room such an incredible facelift. Looks so rich and crisp. Hard to clean without them coming out of place though :( otherwise I gave them 5 stars! I was shocked at how paper thin these were. Should have read reviews. They are still sitting in my laundry room. They are nice looking but can’t imagine how you would use these without something underneath it. Disappointed!!! Expensive for what you get. We're very sorry that the Stratford tiles were thinner than you were expecting! One of our representatives will be reaching out to you shortly to assist with installation and to discuss the advantages of the Stratford tiles in comparison with the traditional, outdated fiber-board type. We appreciate your feedback and look forward to speaking with you soon. Super thin. No sound protection. For 10 a tile they should be much better quality. Can order same ones from China for like .50 a tile. Drop ship trash. We’re very sorry for your dissatisfaction with the Stratford ceiling tiles. You are correct; while the lightweight construction of these tiles allows for easier installation and maintenance, they don’t provide any sound protection or dampening. We’ll be in touch with you shortly to discuss the acoustic options for your project, including our Songiuard Insulation. Our goal is for you to love your tiles, so we look forward to working with you to find a resolution! I love this ceiling tile, a little lightweight but it still looks beautiful. Because of the installation of the grid on our project we only had 1 and 1/2 in of clearance for the tiles to fit in. Because these tiles are so thin and manageable it made the project incredibly easy. I would highly recommend this product and this company. At our salon, we wanted to make sure our ceiling looked as elegant as possible as our guests spend ample time gazing upward from shampoo bowls. We've lost count of the positive comments from our guests. They love these tiles and so do we. Be aware when ordering that they are not load-bearing at all, so and lighting you have will need to be mounted from above. I replaced the old gypsum board ceiling tiles with these. They look fantastic--like a brand new basement! I highly recommend these tiles. Customer service is excellent as well. Easy ordering and quick shipment. Would definitely order again. These tiles were easy to install, lightweight and so beautiful. I am very pleased with how my rooms look now! Thank you for your review. We're sorry to hear that you're having trouble with the installation of the Stratford tiles and would be happy to help. One of our customer representatives will reach out to you shortly to go over your options with you. This is a classy ceiling upgrade! Love this ceiling tile option. It's light weight and immediately gives your space a classy feel. Second time purchasing for another office remodel. Guaranteed to purchase again, should we move locations in the future. Looks great . Wished first partial box had instructions . ITune video did not explain the cleaning or if use alcohol to clean grids for tape application . We figured it out and still worked out . Wow!!! What a difference a day makes. It was roughly 24 hrs. start to finish to transform our 70s basement into a updated living space. These tiles are a great addition to our office!! Everyone compliments them. They were a breeze to put up and cut where needed. A huge improvement over the standard tiles you get at big box stores. Exemplary customer service from Annie as well!! Thank you!! Lots of comments on the style. I used it in my family room and finished basement office. Does require some effort to make sure the pattern is right when cutting pieces but if your grid is laid out right, you'll be fine. Mine was not done correctly. Washable, easy to bend into tight spaces. Made the room look less business like. Would recommend to anyone that wants to give a different look in their office. Very easy to put up on your own. The only negative is that it does not absorb sound so it bounces of the plastic. Everything worked out perfectly. Being a man of course I didn't read the instructions until I was finished and regretted not putting adhesive on the entire trim pieces; so many had to be redone. One instruction said put three dabs on each piece and another said to cover it all. Other then that I was so happy with how flexible each tile was so it was very easy to fit them on the existing grating and the trim covered the old imperfections. Excellent company and delivery was timely and undamaged and I couldn't be happier. Don't waste your time at Lowes or Home Depot when this company is in business. Huge selection available with great color pictures and accurate descriptions. After a few , the technique gets easier . They helped deaden noise upstairs and look great . Must finish with tape for perfect finish . Very good pricing, very fast shipping. I loved the way it turned out. It looks expensive. Easy to install. It was easy to cut and install and it makes a WORLD of difference! Much better than the old cardboardesque tiles. Nice, modern look. Good, affordable solution. Looks great--helped to sell the house! I am a realtor and my elderly client had a small room with acoustic tiles that had seen better days. I ordered these and installed them for her in about an hour. They went up very easily and gave the room a new fresh look! The house sold quickly above asking price! 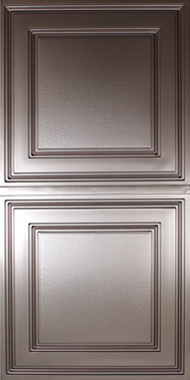 We really like the look of the faux pewter ceiling tiles. I would use them again, but I think they are expensive for what you get. Love Love Love IT!! Easy to install. Looks great! This has been a major improvement for my office!! It was very easy to install. I did leave the other ceiling tiles that were in my office and just added these as I was afraid that there was not enough insulation in the rafters to keep my office cold and I am glad I did. I had been wanting to update our dining room for quite some time. I started to look around for options for the ceiling and found these. After reading the reviews I decided that I had nothing to lose so why not try them. I love them, they are so easy to install, I never even removed the old ones, just left them in place. They don't even look like a drop ceiling. I did spray paint the grid as I thought that the strips were too expensive and that turned out great. I would highly recommend these to everyone. I probably would have gotten the strips to "hide" the grid but they were way too expensive, but overall I love the ceiling. I was looking for a simple replacement to old box ceiling tiles in basement drop ceiling. As a result of bathrooms overheard we do have some water occasionally when toilets overflow so wanted a viable solution. These tiles are perfect and easy to install. I bought this product to replace the old insulation ceiling tiles. I had these installed in a couple hours. Even cutting out the lights was easy. Looks great and makes the basement look like new. My contractor was hesitant at first to install these ceiling tiles because they were so light and thin. However after he realized they met all code requirements, he was astonished by how much easier they were to install vs the generic ceiling tiles. We couldn't be more pleased with the outcome. They turned our simple commercial space into something extraordinary!! Great ceiling lens for fluorescent light! Replaced the lens in my seven, odd sized fluorescent lights. They look great. Simply cut to size with scissors and pop in. Great update to my home. We replaced are old stained hung ceiling tire with the Stratford vinyl ceiling tile. The new tile went up very easy and they brighten up the basement. They are also very easy to cut. I would highly recommend them. Very easy to install and they look great! Some of the reviews stated that the tiles were a little flimsy. When you first take them out the box, I thought the same thing. Once they're up, they look amazing. Being thin, they are much easier to work with than the traditional dropped ceiling tile. We live near the beach and the old tiles were sagging. We just started in the bedroom of our finished basement, then ordered more for the living room. On to the kitchen next. Will upload upload a picture. Thank you! Our basement looks modern and fresh thanks to our new ceiling tiles - everyone loves how it looks and is surprised to find out they are 2x4 faux tiles. It was easy and the customer service is amazing! The ceiling turned out amazing! Ceiling looks fantastic,if not a bit overwhelming. I wish they had it in off white, to tone it down a bit. It's easy to install for a beginner, but a little flimsy, or I would give it 5 stars. The entire purchase and delivery went perfect. Thank you for the great customer service. Tiles look great and easy to install. Will be ordering more. Very happy with the way my ceiling looks! I replaced the tiles in my basement bathroom. Super easy to do and it looks great. My best friend could not tell it was a drop ceiling. Just placed a second order to do the bedroom. I did it myself which is pretty good for an old lady. I love my new ceiling. I took down old acoustic tile and insulation that was more than 40 years old but used the existing grid. I notice that the old tile had soundproofing qualities that this tile does not have. I don't know yet how much this will bother me when someone is watching TV and I am in my bedroom directly above. I installed the tile myself and I am 81 years old. It was very easy to cut with household scissors which was necessary around the edges as this is an old house and nothing is straight. I had can lights installed and the electrician had no problems. They look great and I am happy. We purchased these Ceiling Tiles for our home and it took an average ceiling to a beautiful one. We were so pleased how easy the install was ! I highly recommend this product. The Ceiling Tile arrived shortly after I placed the order. It was packaged very well and there was no shipping damage. It was easy to install and looks great, much better than the old acoustical tiles I had before. We are very happy with this product. Ceiling Tiles look amazing! Super easy to install, and you can't beat the fact that you'll never get those ugly water stains. HOWEVER, these tiles are incredibly flimsy. They canNOT hold any weight at all. Something as simply as a security camera(commercial use), or, any recessed lights will not hold. They are super lightweight and for this reason and this reason only I give it 4 stars instead of 5. Other than that, it's a great product. I couldn't be happier with this product. - Easy to install - Super quick delivery and helpful service - The tiles look every bit as great as I had hoped - It completely changed the look of the room, and all for the better A day after I ordered the tiles on line, I realized I had shorted myself. I called the 800 number and they upped my order without any hassle at all. The service was outstanding. When things like this happen, it is usually like pulling teeth to get it fixed. The mistake was mine, but they made it all go away in a 5 minute phone call. They where easy to install, and easy to cut to fit my ceiling. They are super light and water resistant. Once installed it gave my office a very profecías look. I installed it my self. Look great and easy to install! We replaced old ceiling tiles with these in our basement and they look amazing! We were able to cut them with scissors and put them up very easily. I would highly recommend these tiles! Very easy to work with, looks clean and installs in minutes...highly recommend! Really suits the basement ceilings nicely and couldn't be any easier to install. Great Product and service. Quick delivery and accurate. Tiles look very nice but..
We weren't sure what we wanted to replace our old ceiling tiles with and thought we'd give these a try. We are very happy with the way they look. They really make our basement ceiling look so much nicer. They look more expensive than they were. I need more ceiling tiles to match existing tiles in my salon and finish the look. These were perfect and matched exactly. Easy installation in cramped space. Looks much richer than the plain white dappled panels we had in the ceiling before. Also, they are much easier to install because we have minimum working space, 3 to 4 inches above the grid, and they are bendable. Used these to change my entire basement drop ceiling from white to black, great look, easy to install and trim where needed. Very thin is the only concern. So far no issues. Very nice to work with these tiles. Easy to cut and fit when you have minimum height to work with. Started in our basement family room and like them so much, will finish rest of basement ceilings with them. Used to finish a basement area with many water pipes above, where access is needed. Water damage will never be a problem with this tile. Easy to cut and install. Much lighter and more flexible than I thought they would be. The panels are so easy to install and look so much better than the old school tiles we had. My husband had the entire ceiling done in about an hour. We are very please with our end look. These are so beautiful and have a classy finish. Easy to cut with scissors or an X-Acto knife. I am looking forward to ordering some more in a different color for another room in my rental property. Great customer service. I had to return a box of tiles that I did not use or need and the staff made it a breeze to return them. Recommended for those who like less mess with good results. Puts a little character where it needs it the most. Easy to install, durable and look great. The lightweight solution these tiles offer was precisely what I needed. The bonus was how great the tiles look once they are up and in. I'd highly recommend this product. 100% satisfied with order process, product, aesthetics, etc. however, the price point is little high. So easy to install and looks so clean and polished. Good looking tiles transformed my traditional, basement drop-ceiling into quite a masterpiece. Looking to find a product for my living room space now. A hundred times better than my old drop ceiling! We painted our walls white and went with the latte ceiling tiles. A very clean and sophisticated look. (Google: dark ceiling and white walls). The tiles were super easy to install and cutting to size was easily done with scissors. Also, we painted the grid to match the tiles and that worked fine after a thorough cleaning and light sanding of the grid. If you are unsure of the tiles, order a sample. The shipping is not cheap for the sample, so be sure to order everything you might be interested in at once. By the way, my order arrived in 2-3 days, even though I live on the East Coast. I removed the standard ceiling titles that are often seen in offices, etc and replaced them with the Strarford Vinyl Ceiling tiles. They make a huge difference and they are gorgeous! My contractor had never installed them before, however he watched the tutorials and was a sinch from there. We installed recessed lighting and we even cut for the fire sprinklers. All came out beautifully! Very happy with the product. Has changed the whole look of the room. I was impressed how easy these tiles are to use. They are very thin and incredibly flexible. After I installed 2 or 3, I got the hang of it and they were easy to install. Ceiling looks great and looks elegant. Each time I walk into my bedroom I feel as if i am in a hotel. Looks beautiful. Doesn't look like a drop down ceiling. It was easy to cut with scissors. I installed 4" recessed lights and it works very well. Would have liked the vinyl to be just a bit thicker. During the wiring of the light fixture, a few times the light fixture would move and the weight of thr light on the vinyl made the tile slip out of the grid. Other than that I am very happy. Product was light and easy to install. Love the new look. We were hoping to find an inexpensive solution to ugly ceiling tiles in our new restaurant. These fit the bill perfectly in our public bathroom and hallway areas. This was the best price we could find them on the Internet. Will continue to buy more in the future! Nice and happy about the purchase. Really worth it. The ceiling tiles add a depth and a beautiful funish to the room. They look very nice with the other standard tiles and are clear enough to let plenty of light through. Good product. Complete transformation from an industrial looking ceiling to a warm comfortable looking room. outstanding tiles. used them in a zero clearance ceiling in the rec room. because of the space constraints above the support rails needed help to install (they are quite flexible for one person to handle. however, if you are putting them in a "standard" drop ceiling they would be very easy to install. super easy to trim and cut with just plain old scissors. highly recommended! Way better and cleaner than acoustic tiles to install. Tiles look good. Improves room. The tiles improve the look of the room significantly. The installation took longer than anticipated because many of the tiles had to be cut. In addition, because the tiles have indentations, the installer had to use white caulking where the tiles meet the walls. Easy to install and look great! Looks great, everyone loves the change. This product was used in the Youth building sanctuary and it looks great. While we did not have time or patience to install these in our office on our own, the contractor we hired was able to get them installed quickly and they look great! The only comment I would say is they are NOT acoustic (so they do not absorb sound), so if sound is a problem, these may not be the best option for you. Expense-wise, I priced around and this business offered the best price on this product. Not to mention, they were here OVERNIGHT!!! The local Home Depot wouldn't be able to get them to us in at least a week!!! Bought the 2x4 Stratford tiles to replace our old tiles in our basement. We kept the old tiles and just installed the new Stratford tiles over them to help with sound insulation. We also installed new can lights. I am very pleased with how it all turned out. Nice coffered look for a ceiling tile. It really warmed up our basement family room. Just Beautiful! I searched and this is by far the best deal! Looks awesome in my theater room! Easy to apply! Customer service 5 stars! Thank you! I love my new ceiling! I can't believe the only tool I needed was standard scissors and was able to add dimension and class to my basement bathroom. Best purchase we've made in our whole-house remodel. Using in a room with a warehouse ceiling above. Didn't realize the tiles were very transparent. Shadows of structure above are very noticeable through the ceiling. I had to use ugly acoustic tiles under (over?) my Stratfords to have enough strength to hold up R19 insulation, but it was worth the extra expense to have an attractive ceiling AND substantial insulation. Very pleased. This ceiling tile added a very nice touch to our space. It gave the ceiling a custom look for a decent price. The tile was very easy to cut to fit in the drop ceiling grid but it was a challenge to cut circles. We will need to add some trim around the "circular" holes to make them look better. Overall happy with the purchase. What a difference!!! It makes the space! Recently we renovated a space for our son's Tattoo shop. It was a store front in a building built in 1876, in a charming village. Keeping the year the store was built for designing the interior space, we selected this ceiling tile. We have so many comments on the ceiling and the space. We are so pleased and when we mention it is an acoustical ceiling, people are amazed because it does not look anything like an acoustical ceiling. It was easy to install and the final look ... just terrific! Thank you! These tiles are amazing! Completely change the look of the room! They look very nice on the high ceiling of an old Victorian style sorority house. I sent photos to you. When you first handle them, they seem a bit flimsy,but they look great up. They lie flat -which is a bonus. (I wouldn't recommend laying tin in a 24" X 48" grid. They get bent easily and don't lie flat.) However, if it was my OWN home, I would have gone for a more expensive tile. So easy to work with. Looks like it cost 10X as much! LOVE IT! Did a total remodel on a restaurant, installation was a snap and it looks BETTER than I ever imagined! WILL use product again! I am so happy we decided to do this. The toughest part is figuring out how many panels we would need, so I split the orders to manageable quantities. Love the look, I hate that we waited so long. Looks like a pro did it! These were the easiest things ever to put up they look great and only took minuets to install!!! Family and Friends Give My New Ceiling Tiles 5 stars! Easy to install, impossible to break! I have no complaints. They exceeded my expectations for sheer beauty and practicality. They were fast to install and a great deal on price. Very nice looking. Good value. Great for high moisture areas. VERY lightweight. Easy to install. Will probably need hold down clips for most installations. THE TILES LOOK GREAT BUT ARE VERY DIFFICULT TO KEEP IN PLACE BECAUSE THEY ARE SO THIN. WHILE THE PRICE WAS REASONABLE, I GUESS YOU GET WHAT YOU PAY FOR. Necessary where 2x2s would not work. Had to use a few of them where I had registers stuck that would not allow me to put in a divider to utilize a 2x2 tile. Came in handy for sure. Very nice looking finished product. However, these tiles are very flimsy and sometimes difficult to work with because of that. These tiles sell for about $10 each and probably cost $.10 to make. Overpriced for what you actually get. And unlike traditional ceiling tiles there is no acoustic insulation. There are acoustic tiles you can purchase but those are as expensive as the ceiling tiles. The only reason we went with these was because drywall wasn't an option. 3 star rating because of value and sound properties. Otherwise finished product does look very nice. The ceiling tiles are just beautiful. They bring gteat character to the room. The price is very reasonable and shipping was very fast. I have not completed placing them yet but they seem to be easy to install and look great!. they do alot to make the room look brighter and more contemporary.I am glad I purchased them. We recently remodeled our basement kitchen and of all of the improvements we made nothing made a bigger impact than the ceiling tiles. I wish we had done it years ago! Looks great and was easy to install. We will definitely order again when we finish the rest of our basement. Very pleased with the prices too. Happy so far. Check back with me after a year. Major difference,you can't even tell it's a t-bar ceiling.Several people thought it was a hard lid ceiling.I would definitely recommend this product to others. Fabulous products and spectacular customer service! The tiles are extremely easy to install and give a lovely, finished look to old drop ceilings. Couldn't be happier with the overall experience. 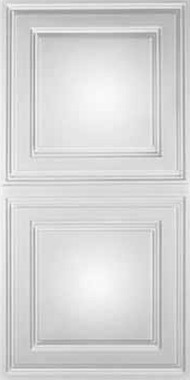 Would recommend to anyone looking for an alternative to the bland boring ceiling tiles available at building supply companies. I used this product for the suspended ceiling in my basement. Installation is very simple. Cutting to fit corners is also very easy. You can use normal scissors. I just wish the product was just a little thicker. There is a part of my ceiling with interrupted rails, due to plumbing. The tile will hung down even if just a part of one of the sides is not supported. This is the only reason I give this product 4 stars instead of 5. Very easy to install. Our basement look amazing! We love this product! The tiles look amazing and are so easy to work with, you can cut them with a scissors! Initially, we we afraid they would sag since they're fairly thin, but they lay really flat and don't bow at all. We didn't order enough the first time so had to get more. Both times we were shocked that they showed up on our door step in 3 days. Highly recommend! Gives a much more refined look than the plain white tiles. Definitely will cause problem if next to a door when it shuts as the tiles are so light. Worked great for my application. 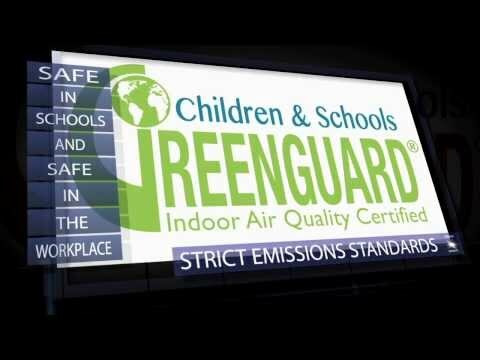 We replaced damp acoustic ceiling tiles in the basement. The change in the look of the room and the ceiling can not be shown with a photo. Easy to install, no more damp smell, and easy to remove to fix a dryer vent. Be aware that the tiles are made to order so some take longer to get than you might think. Very thin, but looks great! This ceiling tile transformed my bedroom from drab to fab. Keep in mind though they are paper thin. Overall, if you don't mind thin, and bendable tile, these are great! Very easy to install and cut. We get "mouth dropping" looks when every one sees it. It completely changed our sun room. I had to replace the old fiberboard tiles in my tattoo shop with something easily cleanable per health code. I went with the Stratford Vinyl in white and they're awesome! I utilized my 2x4 grid I already had and I still get the updated look of 2x2 tiles without any crossbars or extra cost. They're beyond easy to cut, draw a line on the backside and get your scissors out, literally 10 seconds or less and it's cut. Install is pretty easy, I left the fiberboard tiles up in the grid just rotated them out of the way to help insulate, that's the only thing I'd say could be an issue with these thin vinyl tiles is they're not going to provide any insulating properties what so ever, turn your old tiles less to throw out and it's still functional. I started out looking at the wrong side but it still turned out fine! Love the new ceiling. I plan to do the rest of my basement. The ceiling tiles were easy to install and really improved the look of our basement. We have received many compliments from family and friends. So easy to install and fit beautifully. The visual appearance really takes up the appeal of our conference room. Strong suggestion, wear cotton gloves or similar during install - helps to minimize any smudges or getting them dirty. Add depth and charm to a room. Easy to cut and install. East to clean. I painted the grids and installed the tiles so easily for a great new look that updated the whole room. Friends and family can't believe the transformation. the tiles made a new modern look. the ceiling now flows seamlessly. I did two rooms, Living room and Dining room. It made my 90 year old Home look richer and more to the date of homes back then. They was easy to install and cut (did both room in one day). Replacing plain 'old' grid ceiling with Stratford vinyl 2x4 tiles completely updated and improved the remodeled rental unit kitchen ceiling but I was shocked by their very flimsy construction; retained former tiles to provide stability to the replacements; would have preferred the quality of the "tin" tiles but time required to paint them white necessitated utilizing the vinyl. Apprarance is Five Star / Quality is Three Star = Four Star rating! everyone walks in and looks up!!! They look good on the grid, but they are really thin and flimsy. Also, given the quality, I think they are a little overpriced. I had a basement room with a drop ceiling and some slight moisture issues. The old ceiling tiles had become discolored and warped. We wanted to use the room as a living space without spending too much money. These tiles were perfect - they are lightweight and quite thin, so they're easy to install. I did the job single-handedly and was able to cut tiles for partial squares with kitchen scissors. Being totally waterproof, we've had no moisture issues, and they look great for where we have them. 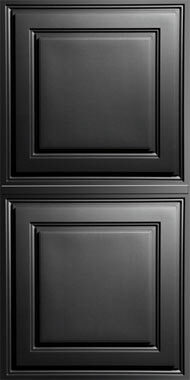 These are not tiles that I would use in a high-end remodel, but they were the best thing for the job in this case and I would recommend them. WE LOVE THIS PRODUCT. WE USED THIS PRODUCT IN THE BASEMENT, AND IT LOOKS AWESOME. OUR FRIENDS AND FAMILY COULD NOT BELIEVE HOW GREAT IT LOOKS. I WOULD RECOMMEND THIS PRODUCT TO ANYONE. LOVE LOVE THIS PRODUCT, GO AHEAD ORDER IT AND FIND OUT FOR YOURSELF, YOU WILL HAVE NO REGRETS. Love my new ceiling tiles. They were so simple to install and easy to take down and clean. I have seen them in restaurants and they look so rich. Super easy to install and look great! This is an awesome product. The only complaint I have is that after reading the manual that comes in the box, I realized that they make shallower tiles used for the perimeter of your space that touches the wall. I suggest that they simply PDF that manual and post it on the website so one can be as prepared as possible. Sorry for any confusion on that ... the tiles referenced in the instructions are border tiles which are designed to be used around the perimeter of the room if you are ordering a tile with a high relief or projection. The Stratford is actually our most popular border tile, so it is designed to work easily up against the wall and can be used in all areas of the room. the material itself is very flimsy but popped into my drop ceiling grid very easily without removing the original tiles. super easy to cut with scissors. totally transformed the space. I was skeptical even after watching the video, but wow, these are stunning and super easy to put up. My basement looks brand new, and they are very easy to cut holes for canned lights. We used our existing track system (would have been a fortune in labor to replace that) and I can't recommend these enough. I hated the original drop ceiling in our lower level family room, so I began my search for a stylish, but economic alternative. Then I found this product that is a fraction of the cost of those institutional looking ceiling tiles. Our family room now looks as though we went with high end products, but has saved us a fortune. They're easy to place and cut to give your ceiling a custom look. We absolutely love these tiles! Everyone asks us where we got these. The price is awesome and they are light and easy to install. They were also shipped quickly and the staff was wonderful to deal with as my wife kept changing her mind~ I will be ordering more as we love the way they add a richness to the room. These tiles look great. Really made a difference in basement. The are a little Thin, though. Super easy install and it looks great. Installed in a basement bedroom with only 2" clearance from joists. Installation is super easy into dropped ceiling grid. Material is a little light, but addition of roll insulation on top of tiles keeps it from lifting when door is closed and cuts light transmission into the overhead enclosure. I would definitely use this again. Very clean look and easy to install. Plan on ordering more. Looks so great in family room! Everyone that sees the new ceiling cannot believe they are vinyl. They change the room appearance so much. I am very pleased. They also are very easy to dust and keep clean. I definitely would recommend these tiles to update any room. This ceiling looks amazing. We put it up in our coffee shop when we remodeled. I get more compliments on the ceiling than anything else and several people have inquired about where to get it. Very happy with this choice! Beyoooteetul! My wife loves it - 'nuf said! Most people don't realize my ceiling is suspended tiles - it really looks terrific. I painted the support grid I used from my 'old' 2 x 4 tiles to match the new ones and the combination looks like old-fashioned 2 x 2 wooden tiles. Lightweight, easy to install and looks good. We replaced an old acoustic tile ceiling that was very old. Since we already had the "bones" of the system in place, we just had to cut the vinyl tiles to fit. We have had nothing but positive feedback on the change in the look of the ceiling since we did this. I would recommend this product to anyone who is tired of the old acoustic tile look. I installed the Stratford tile in a retail business unit. The tiles are a little tricky to install because the are very light weight and flexible. With that said they look great installed and may be great in a basement but they have a tendency to blow out of the grid when doors are opened or closing doors in small rooms like a bathroom. The negative air pressure will blow them out of position! Some sort of clipping system would help keep them in place. I wouldn't buy them again! The look of these tiles are wonderful. So much better than the standard foam tiles that I see in most basements. The only issue we had was having to put a regular foam tile behind the ones where we have can lights as the tiles are very thin. Easy to work with according to my husband who installed them. Product was pretty easy to install family and friends love the difference it has made to our room. We kept the old tiles and just refaced with the vinyl tile. Use the guidelines that are given for measuring and assuring you have enough. Love this product and very Pleased. I love these ceiling tiles! They are a very attractive design and I have received numerous compliments. I have them in a room in my basement with overhead plumbing and when I had a minor leak in the upstairs bath, it made detection of the leak and cleanup a breeze. It could have been a real mess and because these tiles are made of pvc, I just washed the affected tiles and put back in place. I would highly recommend to anyone wanting to update the look of a drop ceiling. Tiles looked fantastic and were easy to install. The only negative is that they are really thin and we installed in a room with a cross breeze so they shifted a little in the breeze. I would definitely use them again however! Looks nice, but kind of flimsy. The tiles look great, but they are very thin and cheap looking up close. A draft from opening a door, ceiling fans, and a/c can cause the tile to become displaced, we constantly have to adjust them because they don't really lock firmly into the t-bar. They also tear, and mar easily. They are much cheaper than the more solid alternatives, but I wouldn't order them again honestly. Very easy to work with and looks awesome in my basement! These tiles are very lightweight, flexible and easily cut with scissors to make installation a breeze. I hung a suspended ceiling in my basement with these tiles and it looks fabulous. They are also easy to move out of the way if you need access to wiring once in place. Very happy with my purchase. The best part is made in USA! The tiles were very easy to use and look great. I replaced the much heavier ceiling tiles that I had that had become discolored because of leaking, but used the old frames without having to change them. It is great to be able to cut the tiles with scissors. Love it! Easy to install. I replaced old ugly 70's stained ceiling tile with this vinyl tile in my laundry room, it made a huge difference. Room is now more modern, clean looking and they were so easy to install, super lightweight. I used the white tape also, and could cut both the tile and the tape with scissors. The ceiling looks so rich and beautiful! I needed some work done on pipes after the ceiling was installed. It was so easy, since they are very flexible and light and easy to remove. These tiles went in the track of the standard asbestos type tiles in our large dining room. They were SO easy to install. We had 2 x 4 tiles already in place and used the existing track. We didn't remove the old tiles, just added these as a facing with them so we could enjoy the benefit of the noise deadening insulation from the ugly old ones. I would buy these again in a heartbeat. The few cuts and trims we had to make were easy and accurate with kitchen shears. This ceiling tile is great!! It made our basement refinishing look really nice and it was so easy to use and trim to size where needed. So easy to trim where the recessed lights were going too. We have had so many compliments on how nice the ceiling looks. Everyone asks where we bought it from. We live in a new subdivision and a lot of the basements need to be refinished and they were looking into buying this tile!! I highly recommend this for your drop ceiling. These ceiling tiles look fabulous and everyone that sees them comments about how great they look. So thankful for an affordable easy-to-use product that is so attractive!